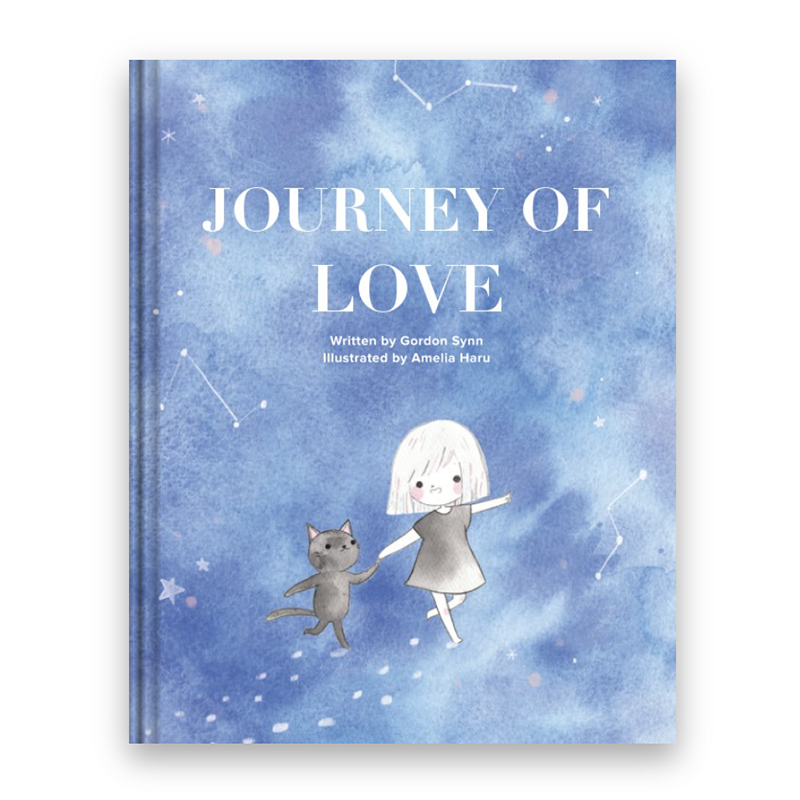 The wonderful people at Thrive asked if I could share some of the themes that inspired me to create the new children’s, and grown-ups’, book called Journey of Love with Amelia Haru. My first confession is that I wanted to write a book that I could read over and over and over again as our children want us to do. And at the same time to maintain my enthusiasm and interest in the story. The other more inspired inspirations I share with you below. I hope you enjoy this story about a story. I first met Amelia, my co-creator of our book Journey of Love, through a local art exhibition. She displayed 12 small watercolors that made me stop in my tracks. The paintings of a young girl and her cat expressed emotions with subtle nuance that moved me–I admit–deeply. I felt on a gut level part of my own life and experiences in those images. The more I looked at them, the more I saw a moving personal story inspired by her paintings. We decided that we would create a book together based on my writing and her artwork. It would be a new adventure for us both like the one taken by the young girl and her cat in Journey of Love. We would be willing to venture into the unknown, and put what we believed to be meaningful and an expression of ourselves out into the world. I wrote the story based on my own personal experiences and with my own two children in mind, Ancelle and Marlon. The book is for both children and grown-ups. Journey of Love is a book that is meant to be read over and over without the grown-up becoming bored, but instead being just as engaged as the child in the story and meaning. 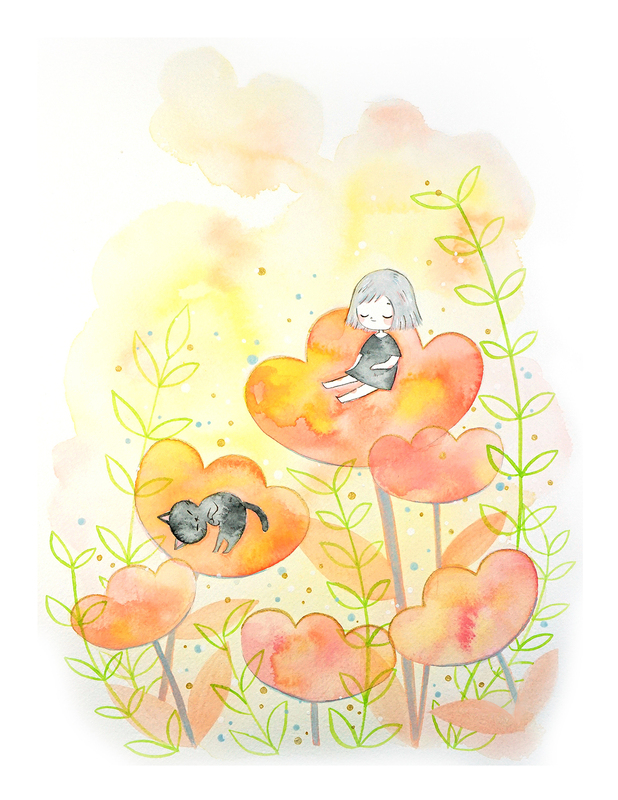 The story is about a young girl and her beloved cat who go on a journey that teaches them about life and love. It is full of fun and adventure and leaves you wiser and happier. The words are lyrical and heartwarming. The watercolors are brilliant and make you smile. The young girl and her cat are faced with obstacles and choices to make about perseverance and faith. They experience ups and downs. They acknowledge and embrace the unknown. And through love they thrive and experience joy. I believe that it allows each reader to see and experience their own life story within Journey of Love. The book has been known to move the reader to tears, but in the good way. Inspiration for the story also came from courage. As I thought about my children and their future lives, I thought about the courage they would need to pursue a path that would be meaningful to them and to others. And that this path may likely be a new one to be forged by them despite the odds. As I looked at Amelia’s watercolors that are so expressive of love to me, my instinct was to want to protect my children now and as they grew up. Yet I also knew that they would have to go on their journey. And face their own challenges. I wrote with this in mind–wanting them to have courage and to also be guided in their choices with wisdom and faith. I also felt an enormous amount of empathy as I looked at Amelia’s artwork. It made me think of children everywhere and some of the obstacles they faced. There is such a poignant expression of innocence in her artwork in Journey of Love. And it brings out a strong feeling of caring and empathy for others. I wrote about this when the young girl and her cat discover the diamond in the ground. And only the reader can see how deep that diamond goes into the earth. And not to give away too much of this part of the story, the conversation and choice that the young girl and her cat make expresses this empathy for others that I find quite moving. Out of all of these, the most important themes that inspired me when I wrote Journey of Love were love and joy. Without consciously realizing it, I think I was writing this story to communicate to my children my strongest desire for them to live and experience life with love and joy. Based on my life experiences–the ups and the downs, the deep and the shallow–I believe it was a way for me to give them this by sharing a story about it. Amelia and I hope that you will be inspired and perhaps enjoy our book with your loved ones. My second confession is that the book is newly available online at Amazon, Barnes & Noble and Apple iBooks. Gordon is a creative producer of books, art and entertainment and wellness content. He has two wonderful children and is based in Southern California, but considers London to be a second home.